But certainly appeared as equal to the fathers of the past. 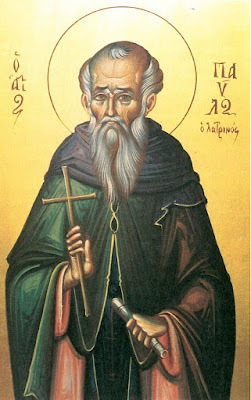 Our Venerable Father Paul was born at Pergamos, near Smyrna, in Asia Minor, the son of an officer in the Roman imperial army, who was slain in an engagement with the Saracens. His mother then retired from Pergamos to Bithynia, taking her two sons with her. 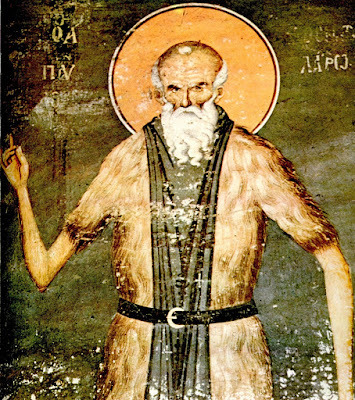 Basil, the elder, took the monastic habit at Mount Olympus in that country, but soon for the sake of greater solitude retired to Mount Latros. When their mother was dead he induced his brother to embrace the same state of life. Though young, Paul had experienced the world sufficiently to understand the emptiness and dangers of what it has to offer. 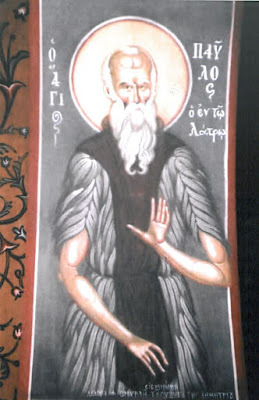 Basil recommended him to the care and instruction of the abbot of Karia, Peter. Paul desired for the sake of greater solitude and austerity to lead an eremitical life; but his abbot, thinking him too young, refused him leave so long as he lived. After his death Paul’s first cell was a cave on the highest part of Mount Latros, where for some weeks he had no other food than green acorns, which at first made him very sick. After eight months he was called back to Karia. Paul was indefatigable in the exercise of holy prayer, and having no other desire than to gain heaven, labored seriously to subdue his body by mortification. He never lay down to sleep, but only leaned his head against a stone or tree. His garment was made of goat's hair, and no unprofitable word was ever heard from his mouth. It is said that when he worked in the kitchen the sight of the fire so forcibly reminded him of Hell that he burst into tears every time he looked at it. Occasionally he disclosed something of the wonderful revelations, which passed between his soul and God, and of the heavenly graces that he received in contemplation. But Saint Paul wished for yet greater solitude, so he passed over to the island of Samos, and there concealed himself in a cave. But he was soon discovered and so many flocked to him that he reestablished three lavras that had been ruined by the Saracens. The entreaties of the monks at Latros induced him to return to his former cell there. The Emperor Constantine Porphyrogenitos (912-959) wrote frequently to him asking his advice, and often had reason to repent when he did not follow it. Paul had a great tenderness for the poor and he gave them more of his food and clothes than he could properly spare. Once he would have sold himself for a slave to help some people in distress had he not been stopped. On December 6 in 956, foreseeing that his death drew near, he came down from his cell to the church, celebrated the Holy Mysteries more early than usual and then took to his bed. He spent his time in prayer and instructing his monks till his death, which fell on December 15, on which day he is commemorated by the Church. Since you dwell together with the bodiless hosts, and are a companion of all the venerable ones, we praise you, most glorious Paul, and we beseech you: Always intercede for us, so that we may find mercy. From your youth, O wise one, you bravely desired that which passes understanding, and you forsook the tumult of the world. Because of your divine way of life you became a dwelling of the Trinity, and enlighten those who turn to you with faith. Therefore we cry out to you: Rejoice, most wealthy Paul.